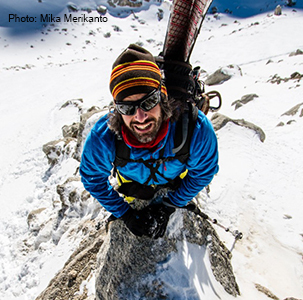 Luca Pandolfi is a native Italian, but has adopted the French Alps as his home. After a few years in Verbier and Gressoney, he moved to Chamonix, where he has made a name for himself tackling some of the most extreme terrain in Europe. He continues to seek out new technical routes and extreme ascents around the world, pushing the limits of splitboarding. Luca is credited with numerous first descents and has ridden and filmed in the largest mountain ranges in the world, including the Himalayas in Nepal, the Andes in Perù, and the Zagros Mountains in Iran. Every time I go to the mountains with my splitboard it turns out to be an epic adventure. Splitboarding allows me to reach remote corners in remote countries. Over the last few years I have explored hidden areas in the Caucasus (Georgia) and in the Zagros Mountains (Iran). These are incredible adventures for me, travelling in countries with a different culture, where people do not speak any of my languages. They open their hearts and their houses for me. Splitboarding on wild unridden mountains and resting in villages where the time seems to stand still. Nothing excites me more! What are you most excited about for the 2017/18 season? A new trip to Georgia in February, a possible trip to Svalbard Islands in the Artic in April and riding pow and new steep lines on my home mountains (Alps) ! And of course all the unexpected trips and projects that always come along the way every winter. Craig Kelly, Marco Siffredi, Jeremy Jones, and Xavier De Le Rue. I ride Spark R&D bindings because they are easy to use and very solid; I trust it on every type of terrain and feel comfortable searching and pushing my limits on big mountains.